With the renovation of Teatro Colón behind schedule, which shouldn’t surprise anyone, the theater will not be ready for its 100th anniversary on May 25th. I also noticed that the Teatro Colón has a new web site, much nicer than the older one (though as of today the new site is still lacking a lot of information). Let’s take a look back at the 1908 season of Teatro Colón, which was filled with productions. Five performances starting on June 24, including a gala performance for July 9. I promise to get back to some postings about things other than the city that fades away series. 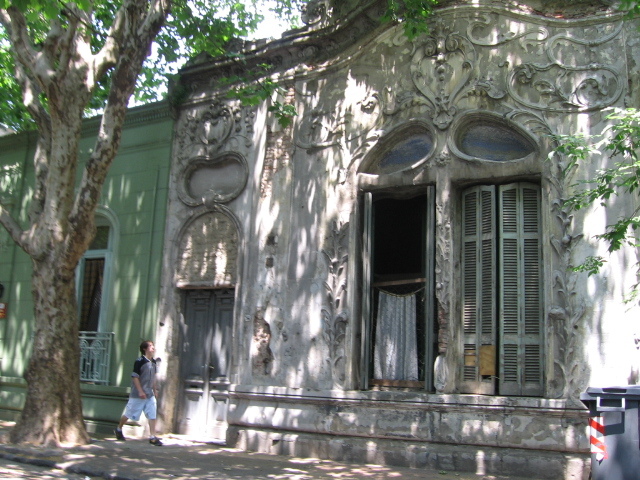 (I have an upcoming set of posts about opera in Buenos Aires). But here’s another place on Virrey Cevallos that I came across, this time in the corner of Constitución rather than Monserrat. Okay, the building that it replaced (again courtesy of the city’s mapping site) was long neglected and the ground floor destroyed. What were they thinking? That ground floor looked like the entrance to a prison. Certainly, demolition and building new was cheaper than attempting a restoration. Not only is it amazing at the rate that older structures are being torn down, it’s astonishing at the many beautiful residences that have become low-income housing. Some people obviously look around Buenos Aires and see tremendous opportunity. 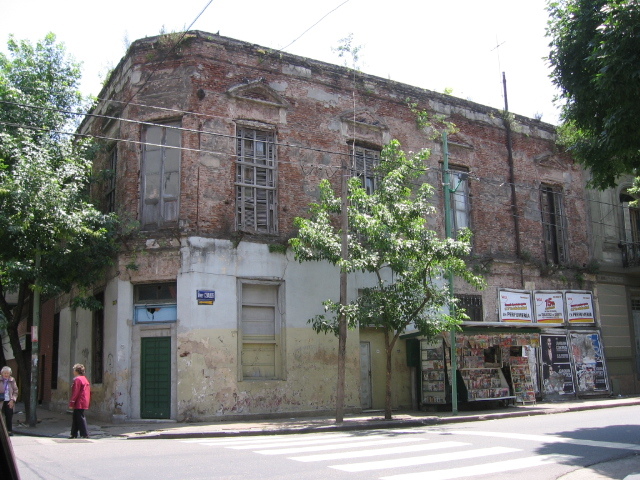 A large population, crumbling buildings, cheap labor, and apparently little regulation make Buenos Aires a dream city for real estate developers. But, oh, if it could just be easier to kick the squatters out of those buildings and foreclosures could be more rapid then the lending market could take off, spurring even more construction, new homes, and …well, the economy here runs in cycles anyway. To be fair, Buenos Aires – like everywhere – has gone through periods of building booms…note all those hideous apartment buildings that seem dated from the 1970s and 1980s. Perhaps most notably was the massive demolition of entire city blocks to create Av 9 de Julio, the diagonals, and let’s not forget, even Av de Mayo. Most of these lovely buildings of faded elegance replaced previous structures. 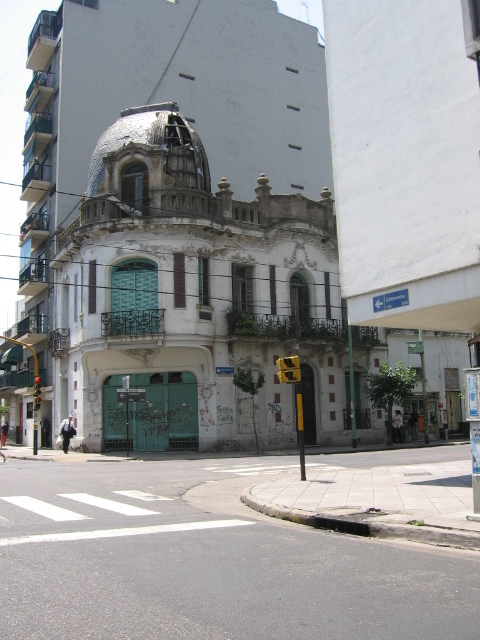 Will the new construction displace an essential character of the city, the architecture that currently distinguishes Buenos Aires from most other cities in the Western Hemisphere? I just had a vision of the future of Buenos Aires: in an attempt to ease traffic congestion, an elevated highway is constructed above Av 9 de Julio. This new apartment building is going up at the corner of Virrey Cevallos and Chile. That’s actually a very good location if you want something in the center of the city. But look closely at the edges of the neighboring building. Demolition crews do a sloppy job, leaving traces of the former structure. What was this places before? I want to say that I remember this corner from 2003 but I’m not sure. Perhaps I’m mistaking it with some other similar corner. 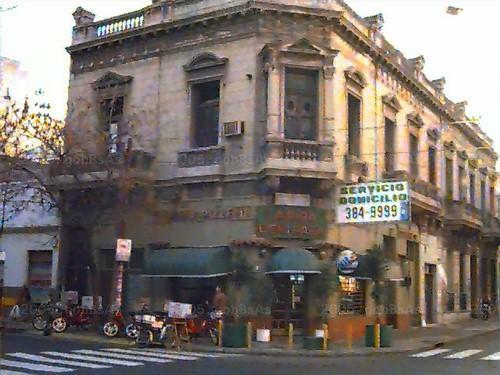 Well, perhaps Buenos Aires only needs one corner like this and the rest can go away … in this city that fades away. Yes, it’s time for another entry in the City that Fades Away series. On the way to the fish market Saturday I saw this building on Piedras that is getting prepped for demolition and the construction of something new. (My research gladly shows that nothing noteworthy was at the spot of this new building). At the end of the very same block of Piedras is this house that has undergone renovation. Fortunately, it didn’t meet the fate of this other house further up Piedras. At some point around two this morning I finally got around to reading this thoughtful essay by fellow San Telmo resident Marcelo Ballvé, The Literary Alchemy of César Aira. Marcelo makes the case that Aira’s book “An Episode in the Life of a Landscape Painter is one of the great works of world literature from the last 25 years of the last century, as good if not better than W.G. Sebald or Roberto Bolaño.” That’s a pretty strong statement, particularly considering the Bolaño mania of the past year. (But Marcelo is far from being alone in his praise. The Aira novel was recognized as the most extraordinary book in translation of 2006). Someday when I want to think more about it, there are some intriguing aspects to Aira that foreshadow developments in new media and, perhaps, the future of literature. The lack of editing so that writing retains an always forward motion, a continuum, is today most clearly seen in blogging, a form of writing which is rarely self-edited and by its very chronological nature is in constant movement. All of which makes me think that Aira would be one of hell of a blogger. (Does he have a blog?) Well, maybe if he was a few decades younger then he would be a blogging, Twittering fool. After all, is literature about writing or creating physical objects known as books? It’s a gorgeous house, certainly worth a visit. 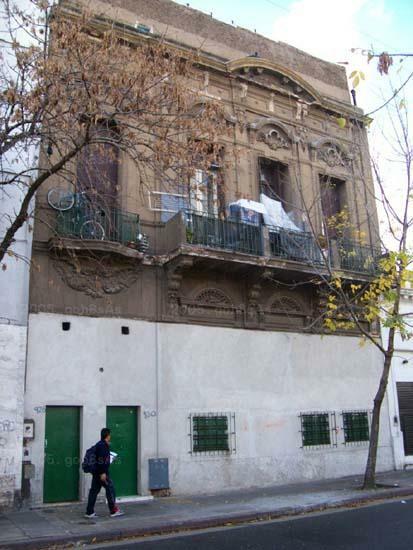 If you can make it out to San Isidro, then stop by Victoria Ocampo’s house in Palermo….it’s a very different style. 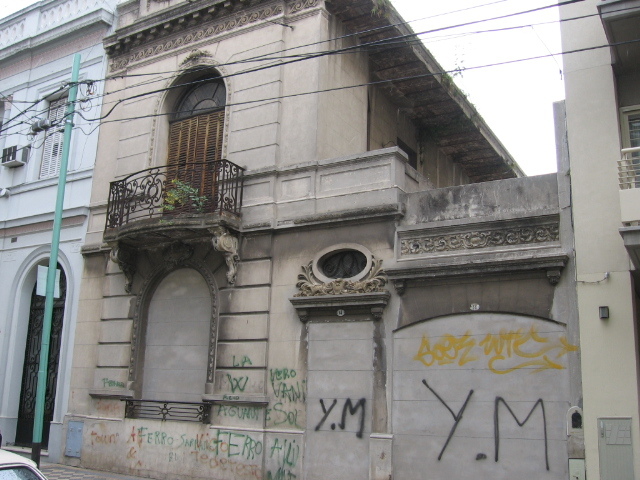 One of my readers here in Buenos Aires, Dolores, sent me the following photos of abandoned or taken houses for the City that Fades Away series. That cupola can’t last much longer, can it? That window is a beauty. I’ve seen the exterior of this house myself and it’s wonderful. Notice that the windows and entrances are blocked over to keep people out otherwise empty houses become prime targets for squatters.